This week’s Friday psyche is coming full circle; or so says the title of Mike Williams’ article on me in DPM Magazine. For anyone interested in how I came to find such a great gig in life here is my history. It begins on page 28. Next up will be a story on how I started referring to myself in the third person. 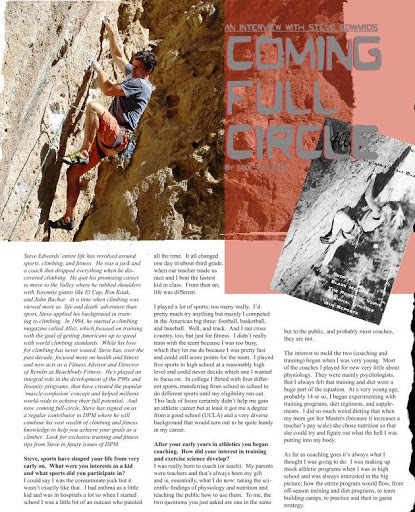 DPM is a one of the cool new climbing mags on the scene. In fact, the Friday psyche has come full circle as it started with DPM. Though you can find it in print it’s very electronic (wave of the future, Dude). Reading takes some getting used to but, once you do, it’s pretty to find much fault in the format. I suppose the biggest negative is that you can’t take it in the loo. Anyway, I’ve already began to write a series for them on training for climbing. The first article is here (beginning on page 30). Cool mag. Great interview! I may have to try climbing one of these days. How's PHD going? I now know why you always supported me when I asked about trying weird diets or weird supplements, because you yourself went through the same process. I experimented so much that now I have written down in a journal exactly how many calories I need to increase to gain, maintain and lose as well as when to start loading up on carbs for to increase glycogen in the muscle before a hard training session. Experience as they say is the best form of learning out there. Still on the boards. Always!